The newest member of Cabinet in Fiji, the Minister for Agriculture, Fisheries and Forest, Lieutenant-Colonel Inia Batitoko Seruiratu has urged the need for cooperation and partnership to grow the Fijian economy sustainably. 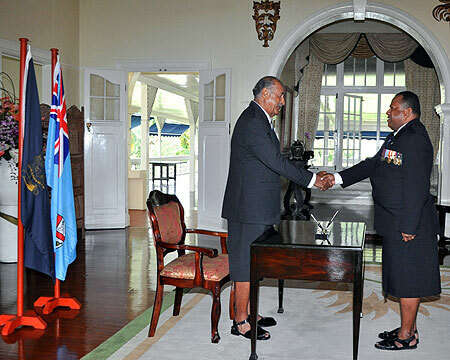 The former permanent secretary for Provincial Development and National Disaster Management was today, Friday 16 November 2012 sworn-in as minister by His Excellency the President, Ratu Epeli Nailatikau in the presence of Prime Minister Josaia Bainimarama at Government House. HE President of Fiji congratulates Mr Seruiratu after being sworn in as Minister for Agriculture, Fisheries and Forest. While congratulating Mr Seruiratu, the President told the new Minister that his appointment was well deserved. 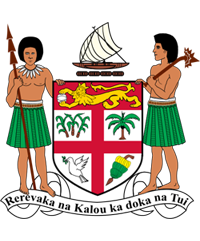 On his part, the Minister said he looks forward to the opportunity and challenge since his portfolio is very critical to Fiji especially in terms of its contribution to the gross domestic product (GDP). Mr Seruiratu said Government and the stakeholders need to work in partnership as the State has the expertise and the funds but needs the willingness of the people and their contribution. And that the industry can advance forward, but if there is unwillingness the intentions of Government will not be realised. He urged people in the rural areas and all stakeholders to work in partnership to move the nation forward and grow the economy which “will be good for everybody”. Mr Seruiratu further elaborated that the country have abundance of resources and agriculture and fisheries is where these resources can be better utilised for the benefit of Fiji particularly in the area of integrated rural development and how this can address the socio-economic issues. First on his agenda is to look at how both the organisations fit into the context of the changing environment. The ministry has two permanent secretaries as it is considered quite vast but the Minister, who had also served as the Commissioner Northern earlier on, is ready to take up the challenge. Following on his taking up the appointment, he pledged that the important thing to do right now is to look at the strengths and weaknesses, what are the opportunities there and ensure that effective, efficient, relevant and current measures are undertaken in the way things are done and most importantly the alignment to the 11 pillars of the People’s Charter. This is very critical particularly on promoting economic growth and the two ministries play a significant role. The Japan Rugby Football Union (JRFU) has announced its online sales and promotional activities for the TOKYO SEVENS 2013 scheduled to take place from Saturday 30th March till Sunday 31st March 2013. TOKYO SEVENS 2013 is said to have 16-confirmed teams participating in the 2-day HSBC Sponsored series tournament, including Japan. Whilst visiting the Embassy on Wednesday 14 November 2012, JRFU-TOKYO SEVENS 2013 Coordinator, Ms Amy Matsuo said, “JRFU has started its promotional activities online, and that they will be selling “Super Early Discount Non-reserved Tickets” between now and the end of the year”. The approach is part of JRFU’s program to attract many spectators for the event. JRFU is also offering “Enjoy Partner Corporate Packages” to companies that may be interested in purchasing tickets in bulk and having their company logo advertised during the 2-day tournament. The precise detail of the tournament and tickets sales for reserved tickets will be issued early next year, 19th January 2013. Following HONG KONG SEVENS 2013, TOKYO SEVENS 2013 Fiji Team Members are scheduled to arrive in Tokyo on Monday, 25th March 2013, and are expected to return to Fiji on 2nd April 2013. Further precise details will be advised in our next meeting, early next year. The Embassy thanked Ms Amy for her time and look forward to further promising communication and exchanges of detailed information.